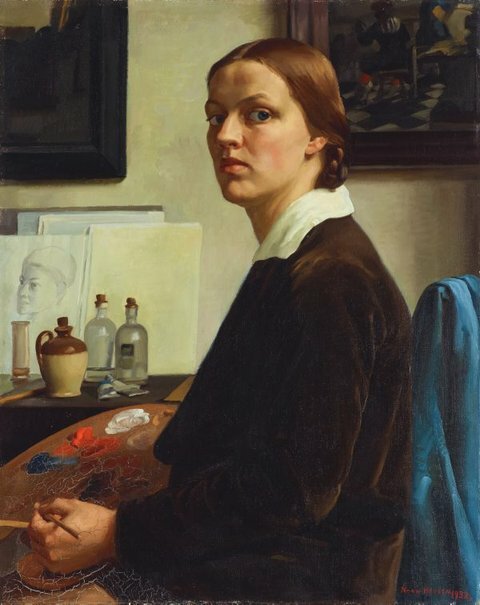 Nora Heysen’s self-portrait strongly articulates her identity and ambition as a young artist, independent of her famous artist-father Hans Heysen. Characteristic of her 1930s’ paintings, 'Self portrait' is powerfully composed with precise, strongly defined forms and earthy colours recalling European masters of the early Renaissance. After undertaking study in Europe, Heysen established herself as a distinguished portrait and still-life painter. In 1938 she won the Archibald Prize, the first woman to have done so. Signed and dated l.r. corner, red oil "NORA HEYSEN. 1932.". Michael Brand, Look , 'From the Gallery director', pg. 9, Sydney, Aug 2015, 9, 20 (colour illus.). Deborah Edwards, Australian art: in the Art Gallery of New South Wales , 'Classical allusions', pg. 135-136, Sydney, 2000, 135, 142 (colour illus. ), 143, 300. Bruce James, Art Gallery of New South Wales handbook , 'Australian Collection: Painting and Sculpture', pg. 102-181, Sydney, 1999, 142 (colour illus.). Lou Klepac, National Library of Australia news , 'The Heysen legacy: the work of Nora Heysen', pg. 7-10, Canberra, Nov 2000, 22 (colour illus.). Lou Klepac, Nora Heysen , 'Nora Heysen', pg. 1-6, Canberra, 2000, back cover (colour illus. ), 18 (colour illus. ), 50. Rosemary Lloyd, Yearbook of comparative and general literature [Vol. 49, 2001] , 'Objects in the mirror: gendering the still life', pg. 39-55, Bloomington, 2002, 46, 52 (illus.). Drusilla Modjeska, Look , 'Self-expression', Sydney, Jan 2017-Feb 2017, 57 (colour illus.). Look , Sydney, Oct 2007, 45 (colour illus.). Nora Heysen: light and life , 'Natural talent and industry: Early years in Adelaide', pg. 12-21, Kent Town, 2009, 17, 18, 51 (colour illus.). AGNSW Collections , 'From Colonialism to late Modernism', pg. 7-106, Sydney, 1994, 43 (colour illus.). The Encyclopedia of Australian Art , St Leonards, 1994, 339 (illus.). Nora Heysen , Sydney, 1989, 9, 26 (colour illus. ), 78. A memorial volume to Howard Hinton patron of art , Sydney, 1951, 130 (illus.). Look , Sydney, Nov 2009, 48 (colour illus.). members events section hightlighting forthcoming 'Nora Heysen: Light and Art', S.H. Ervin Gallery. Heysen to Heysen: selected letters of Hans Heysen and Nora Heysen , 'Introduction', pg. 1-19, Canberra, 2011, 2, 329. Sotheby's Sydney: Important Australian Art (31 August 2010) , Melbourne, 2010, 52, 53 (colour illus.). RELATED WORK: cat.no. 23; titled 'Self portrait' 1932, 76 x 64cm, private collection. This work is illustrated on page 53.